A big draw of the XDA-Developers forums is the availability of custom AOSP-based ROMs such as LineageOS, ResurrectionRemix, ParanoidAndroid, and many, many more. Thus it’s no surprise that most of our readers will prefer how stock Android looks over a third-party OEM ROM like MIUI. MIUI is the heavily modified Android version that Xiaomi releases all of their phones (except for the Xiaomi Mi A1) with. While you would expect many of Xiaomi’s mainstream consumer base to be fans of MIUI over stock Android, it seems that a large number of Xiaomi customers actually prefer Android One over MIUI, at least according to a now deleted poll posted by the official Xiaomi Twitter account. Users were asked to vote for their preferred Android software experience between MIUI 9 or Android One. It’s likely that the social media team behind the Twitter account misread their own audience, and as a result, it backfired hilariously. Companies often do this, as it shows off their reputation and can even convince consumers interested in their products to buy them if they see fan polls go well. 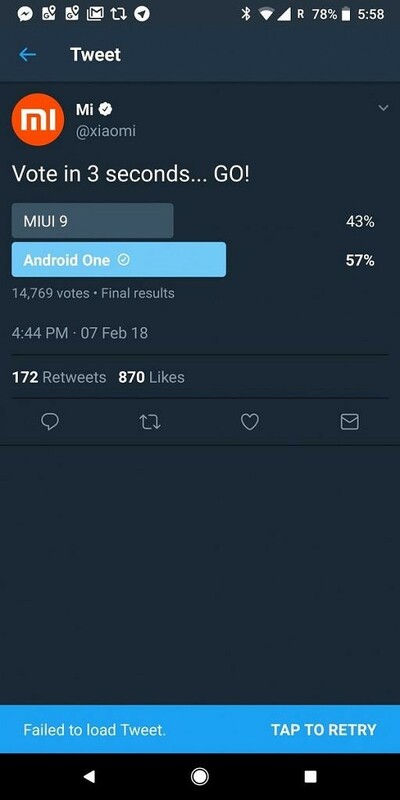 However, shortly after the tweet went live, it was deleted when 57% out of approximately 15,000 voters voted in favor of Android One over MIUI 9. Oops. It’s not too surprising that many fans of Xiaomi’s hardware are fans of stock Android, as according to LineageOS statistics (disregarding the unknown category) India and China are number 1 and number 3 for LineageOS installs, respectively. These are the regions Xiaomi is most popular in, so the results are not quite as surprising as they looked at first glance. It’s unknown if Xiaomi will take this particular feedback to heart, as it simply seems like the company’s social media was trying to engage its audience in a fluff poll rather than actually asking a serious question. That’s not to say that users, when faced with a custom Android skin, won’t prefer MIUI over others. This is ultimately a pretty embarrassing (but funny) ordeal for the company and showcases the dangers of posting controversial polls on official social media pages when you expect your own product to win.